You know fall has officially begun when you start receiving winter squash in your CSA share. 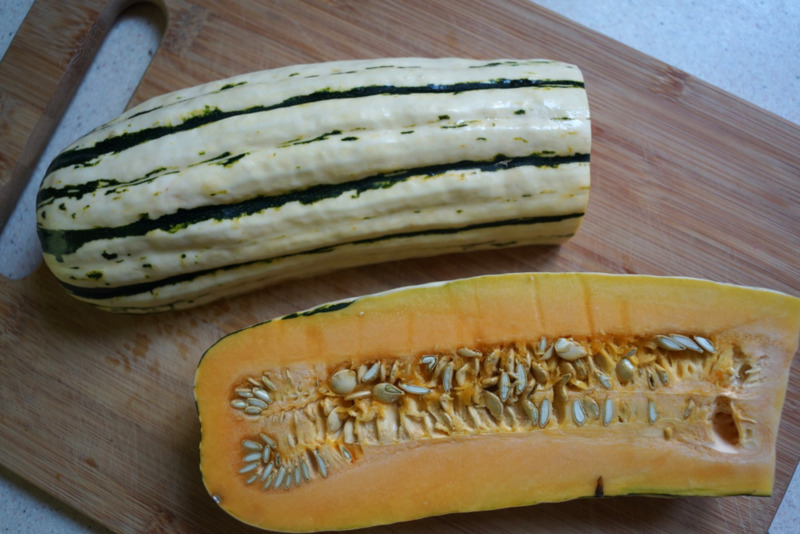 Just last week, my share included, among many other delicious veggies, two lovely little delicata squashes. I know this is only the precursor to many more squashes to come, but I couldn’t help being excited about these little guys. It didn’t take me long to get cooking with them. After pureeing one of my delightful delicatas to bake into squash bread (hint: they are also a perfect replacement for pumpkin in these fall-centric cinnamon rolls), I still had one left. And with a fall chill in the air, I can never pass up an opportunity to turn on the oven. So obviously, some squash roasting was going to go down. If you’ve never experienced the gloriousness that is delicata squash before, well, you’re in for a treat. Sweet, satisfying, and with super tender skin, it’s ideal for roasting. And best of all, no peeling required! I sliced up my squash, tossed it with some olive oil, and roasted it until I was left with sweet, crispy little crescents of squashy goodness. And then? Well, quite honestly, I wasn’t sure. I mean, I could easily have devoured the entire pan as they were. But, while delicious, a pan of squash is not necessarily the most satisfying of meals. Of course, if instead, one were to toss said roasted squash with some greens, crunchy walnuts, creamy blue cheese, and a warm sweet/salty maple bacon vinaigrette, well now we’re talking. 2. Toss the squash slices with the olive oil, salt, and pepper until evenly coated. Spread squash slices in an even layer on a baking sheet and bake at 400 degrees until they begin to turn golden brown with crispy edges, about 35-40 minutes. 3. When squash is nearly done roasting, start the dressing. Place the bacon pieces in a pan over medium heat, and cook, stirring occasionally, until bacon pieces are crispy. 4. Remove bacon pieces from pan, and transfer to a plate lined with paper towel. Carefully pour the bacon grease into a heatproof bowl or jar. 5. To the bacon grease, add the maple syrup, apple cider vinegar, mustard, and a dash of hot sauce. Whisk together until well combined. 6. In a large bowl, toss the salad greens with the dressing, divide evenly between 4 plates. 7. 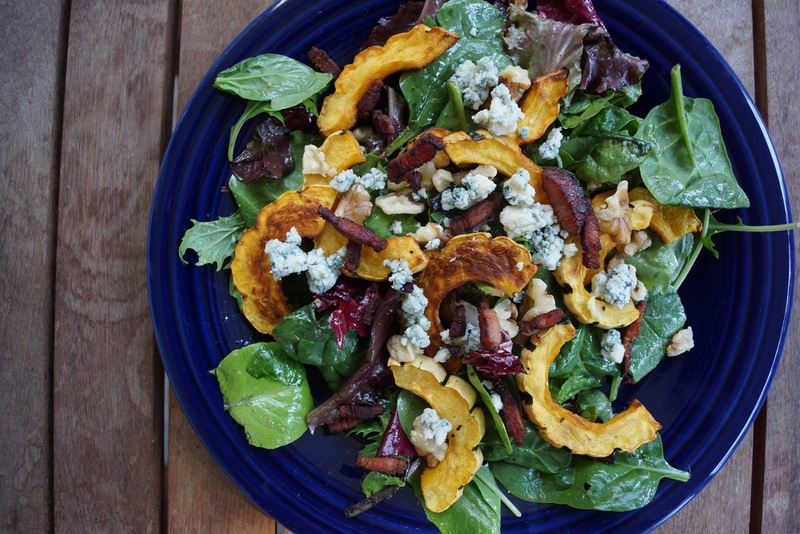 Divide warm roasted squash, crispy bacon pieces, walnuts, and blue cheese evenly between all 4 salads. Top each with a bit of freshly ground black pepper, and serve immediately.